How do you choose packing wrap? Whether you are moving, packing and shipping fragile items, or boxing and storing valuables away in your attic or basement, how you choose packing wrap is an important step toward protecting delicate possessions. Bubble wrap, packing paper, packing peanuts, foam and shrink wrap are some of the most common packaging materials. The general rule to use when you need to choose packing wrap is to select the product that will best protect, cushion and secure the item that you are packing. 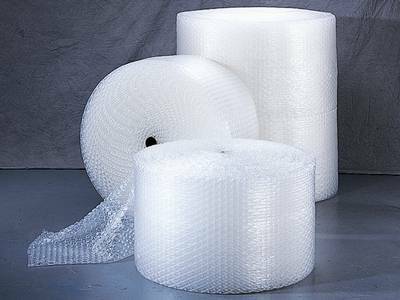 Bubble wrap is easy to use, can be wrapped completely around an item and secured with tape, and provides adequate cushioning for item that are not breakable, but that may be in danger of nicks, bent corners or scratches. Packing paper will wrap an item, like a book, to protect it from scratches or tears, but will not cushion it from breakage. Packing peanuts are generally used in addition to another packing material. Packing peanuts will fill the empty spaces in a box - or rigid envelope - to prevent a wrapped item from shifting. Packing peanuts will also protect a package, or an item inside a box, from being crushed or damaged by external objects. To use packing peanuts, select a box with about three inches larger on all sides than the item you will be shipping. Put 3 inches of packing peanuts in the bottom of the box. Place the bubble- or paper-wrapped item in the center of the box, on top of the packing peanuts. Fill the empty spaces on all sides and above your item with packing peanuts. The peanuts should provide a cushioned, non-moving shield for your item. Foam is used in a manner similar to packing peanuts, and is less messy. Shrink wrap is an excellent option for packing like items that need to be prevented from shifting in transit. For example, multiple books, files or non-fragile objects can be placed in a group and then wrapped with shrink wrap. The wrap will cling to itself and secure the items. Shrink wrap is also good for protecting large items that will be moved without a box, like furniture, lamps or rugs. Shrink wrap can protect objects that might not be at risk of breaking, but can get scratched, soiled or otherwise damaged, like metal and stone. Recently, a variety of environmentally sound packing alternative versions of these classic packaging materials have become available. Many packaging manufacturers have responded to the green movement by replacing standard plastic and foam materials with eco-friendly products made from recycled materials, or organic substances that will break down and biodegrade in a short time span, rather than take up space in landfills. If you are choosing packing wrap, taking the time to research environmentally sound alternatives, even if they may cost just a few pennies more, is a vital step toward reducing your carbon footprint on the planet. If you are planning a move, mailing or transporting fragile items, or merely packing seasonal items away for storage, here are some tips and recommendations pertaining to organic, eco-friendly packaging materials. Plastic and Styrofoam packing peanuts have been used by companies worldwide. They have proven strong enough to to stand up to the shipping process, and soft enough to cushion delicate or fragile items. The problem with plastic and Styrofoam packaging peanuts is that the process of manufacturing them produces substantial hazardous waste. Furthermore, they take a very long time to break down. Instead of plastic peanuts, opt for the new eco-friendly cornstarch peanuts. Equally as durable as plastic and Styrofoam peanuts, these items are all natural and organic, and will biodegrade easily in warm water. Rather than spending money on special packaging papers, foams, bubble wraps or peanuts, make a point of saving your old newspapers. Newspapers can be recycled as packing wrap, and even used as wrapping paper for gifts. Until quite recently, the packaging material known as bubble wrap was only available as an ecologically toxic plastic polymer film requiring hundreds of years to break down in landfills. In 2008, however a British company called PH Flexible, located in Derbyshire, England, designed the first compostable bubble wrap. This product, called Compost-a-Bubble is made from a compostable organic film, which is biodegradable within 90 days. PH Flexible states that Compost-a-Bubble is "ideal for retailers who require an environmentally friendly protective wrapping for items such as fruit, vegetables or flowers, which enable them to dispose of any unsold product and packaging as a single item." Hopefully, more packaging companies and manufacturing plants will follow suit and make the move toward designing greener packaging solutions and products. Shipping supplies can be eco-friendly, as well as effective and economical. Ultimately, this growing market has the potential to replace traditional plastics, Styrofoams and synthetic polymers.